Couple of months ago I've shared with you the Hungarian csabai sausage. 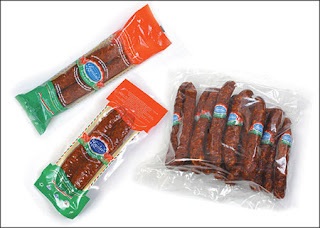 Now I recomend you the Hungarian gyulai dry sausage. To be honest I love both of them. The gyulai sausage means not only a product from the Meat Combine of Gyula, but it means a traditional sausage recipe too. The MEAT COMBINE OF GYULA Plc is one of the oldest Hungarian meat industrial companies with long-standing quality and traditions. Livestock farming and trade has a history of more than two centuries in Békés County. From the Middle Ages Gyula had become an important commercial center. Periodically, great animal fairs were held here, which attracted both merchants from Hungary and the neighboring countries and traders from Nuremberg, Munich, Dresden and Vienna. The traditional animal husbandry furnished a firm basis for the foundation and development of butchers' dynasties. In 1868, the town had a slaughterhouse built (today it is an Industrial Historical Museum of Meat Industry, an Apprentice Workshop) thus started the history of the Meat Combine of Gyula Plc. Gyulai is one of my favorites. Always nice to read a blog from a fellow sausage lover. Please let us know if you would like to see contents in English.